Not so very long ago, being able to control technology with simple our voice seemed like the domain of science fiction and a long way off becoming a reality. Fast forward to 2019, and the voice revolution is well and truly here. Voice-activated devices and smart speakers are being bought and used in homes to achieve more and make life easier. And there’s no reason for you to miss out. At Powerbutton, we stock a fine selection of smart speakers from Sonos. 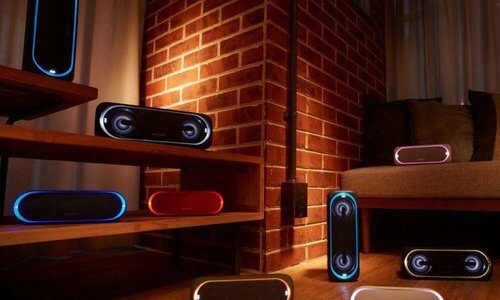 This is one of our most sought after product ranges, and so to help offer more information and clarity as to what the best smart speaker for your needs are, we’ve put together this latest Powerbutton blog. If the name Sonosdoesn’t mean anything to you yet, it soon will. Sonos is the wireless home sound system that helps make music, TV, movies and more an enhanced sonic experience thanks to superior sound quality and design. The Sonos range of products delivers engaging, impressive audio quality that will help reinvent your relationship with sound. The Sonos range is broad and dynamic. From smart speakers to soundbars to playbars, there are a host of options to select from. So without further ado, what do we have at Powerbutton when it comes to Sonos Smart Speakers? The Sonos One is a compact smart speaker that comes with the Alexa virtual assistant. It is ideal for kitchens and living rooms, and music fanatics will love the crisp quality on offer. Six custom microphones mean that the speaker will hear you from anywhere in the room when you ask it to do something. Designed with security in mind, the speaker’s illuminated LED indicator means users will know when the microphone is active or inactive. These are great for busy families that love music and film, and we have a range of Sonos One optionsto select from. Sonos Play smart speakers are sleek in style and perfect to add to a room to help bring a new level of sound quality – without the speaker being an overbearing presence. The Sonos Play:1is the smallest Sonos smart speaker in our range and is ideal for those people looking to bring great sound to every room of their home. This is perfect for spaces such as bookshelves, counters, side tables and more. The Sonos Play:5is at the other end of the spectrum, with this large home speaker delivering deep, bold sound. This is the perfect buy for someone seeking a truly exceptional level of sound quality. TVand film fanatics will love the audio benefits the Sonos Playbasedelivers. Full cinema sound is possible – all from a device that slides seamlessly beneath your television screen. 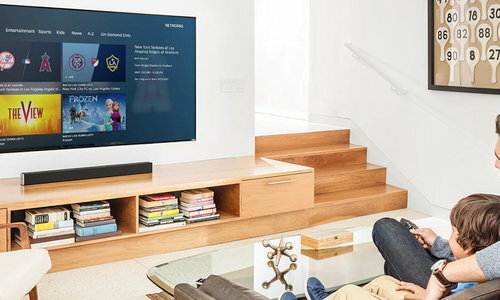 The Sonos Playbaris a great soundbar option for any home. Perfect for watching films, sports, your favourite TV programme or for streaming music, the Sonos Playbar is a great option for anybody that likes to kick their feet up at the end of the day and immerse themselves in visual or audio content. If you want to hear every note and nuance of your favourite music, the Sonos Subis for you. Delivering even the lowest frequencies, with crisp mid and high-range frequencies, the Sonos Sub takes music and audio delivery to new levels. Meanwhile, the Sonos Connectis the perfect addition to any music lover’s home as it enables music to be easily streamed across a range of speakers. This means it’s easy spread the sonic joy. 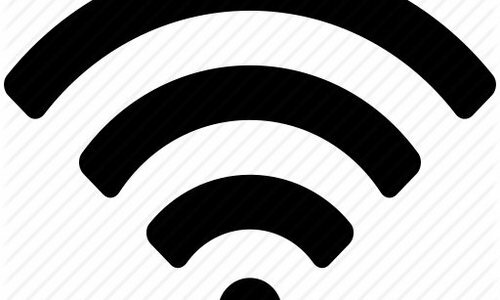 We also have Sonos Connect Ampsavailable. 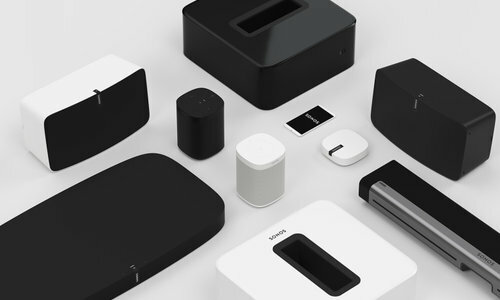 To truly integrate the capabilities of Sonos into your life, we have an awesome selection of Sonos accessoriesfor you to pick from. Whether you need stands, brackets or something else, Powerbutton is the place to shop. 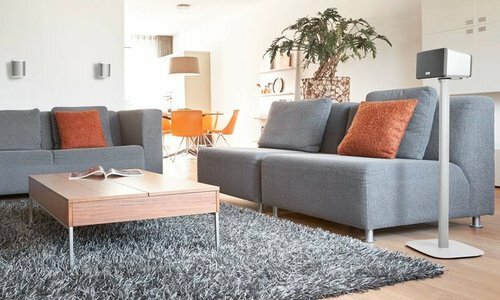 Many of our items are made by Flexson – a dedicated manufacturer of Sonos accessories with a focus on quality and ease of use. We have a host of package deals available too to help you save money. So, know what Sonos smart speaker you want? Powerbutton is the perfect place to get it. 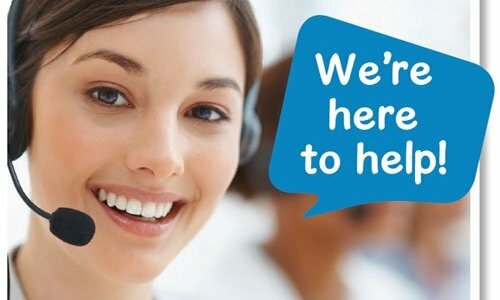 We offer great delivery options, and our team is always will to offer expert guidance and advice. Simply give us a call on 01275 848180.